The dwarf did a circuit of the room, letting his dwarven stoneworking and engineering knowledge clue him into any odd construction. At Hasan’s suggestion that the handprint might be magical, the dwarf kept a wary distance from it. Nicolai wasn’t confident around magic and nodded to Miklos as he followed him into the room. “Over to you, Miklos.” he said with an encouraging grin. He stood next to the doorway in case a speedy exit was required. Somewhat taken aback at his friends insistence that he, Miklos, was worth sacrificing to some cunning elvish trap? The room stretched before him, but he couldn’t turn his back now and let his courage fail him. Not in front of brave folk who have risked their lives to save him. Who else was better trained to unravel the defenses of Elyas? His mind racing at what could befall a man in such a room. He put his hand onto the palm print with a fervant wish not to have his soul ripped from his living flesh. 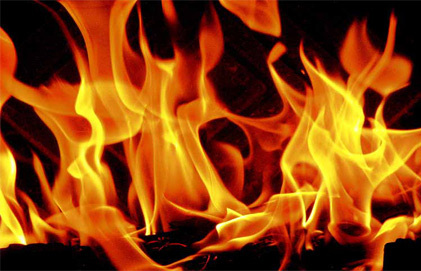 As he did so, the room darkened, and a column of fire erupted above their heads along the length of the ceiling. The sound of a disembodied voice, speaking in Elven, filled the chamber, speaking over the sound of the crackling flames. Thankfully, the mage’s knowledge of many diverse Elven dialects enabled him to understand the words. The first eats, yet is never full. The second runs, yet is never weary. The third cries, yet is never seen. Hasan was glad to see the company reassembled, but disappointed that his examination of the obelisk had yielded no further intelligence. Still, the time had not been wasted, the elf believed, for he had a premonition on the way forward. 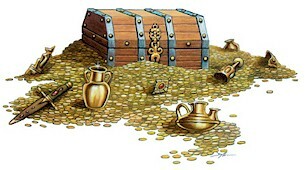 “Nicolai’s observation that the ancient treasure is that which we just passed is sound. Let us head that way,” the elf suggested. He headed to the north door. Feldard for his part had remained behind with Hasan.. checking the room and obelisk over. He was itching to press on. The witch had only been a room ahead as they’d fought the cat.. yet now.. who knew what devilry she had in store with time to prepare? All this ‘methodical caution’ was beginning to grate on the impatient dwarf. 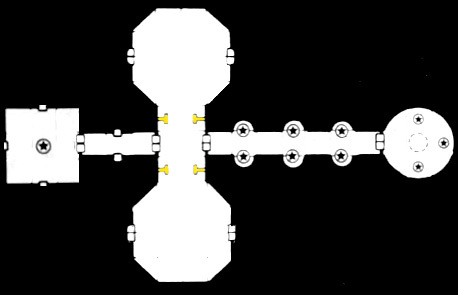 At the return of the others, Feldard nodded his agreement with the Siswa elf and stood in a offensive position alongside the door as Hasan opened it to reveal a large rectangular room with a high arched ceiling. The room was covered with frescoes depicting raging flames and firestorms. The the west end, an altar stood atop a platform. Behind the altar, the life-sized shape of a right hand was engraved into the wall. Moving into the room, Feldard took a pace or two to the left side, allowing for better freedom should battle present; but disturbingly the room was empty save more doors and yet another obelisk. “Quit hiding, Witch! Show yourself!” Yes, poor Feldard was getting rather annoyed at this game of hide and seek. “Temples three,” Hasan muttered, studying the three golden doors, stunned himself to find the party not engaged in a climactic battle. “Could these three doors provide the paths to the three temples? I know no rumor of three temples, but much knowledge has been lost in my tribe,” he bitterly concluded. “What does that writing say Miklos?” asked Nicolai. “Then to gain access to those chambers we must try the doors in the corridor first and work our way round?” the priest suggested. Nicolai turned on his heal and listened intently at the door in the south wall light caressing his expert hands over it searching for anything unusual before handing over door opening duties to someone more appropriate. Hasan saw the good sense of the cleric’s counseled forebearance. Still, he felt no interest in the doors of the corridor behind. As the others turned to those doors, the Siswa remained in the inner sanctum. He approached the pure obelisk and began a thorough examination. How, he wondered, would the Opal Eye be connected to the smooth-faced object. It wasn’t long before the others returned to join Hasan. On either side of the hall were empty bedchambers—neither of which seemed to contain anything that would be helpful to their cause. “Let’s follow our main quarry as quickly as possible,” urged Hasan. “While we will catch none unawares at this point, we may yet catch them unprepared.” The driven Elyan elf moved forward to the main bronze doors impatiently, although he slowed himself enough to train his hunter’s ears to them before opening, hoping that he may gain some clue of what to expect on the other side. The dwarf silently glowered at the thought of how close he’d come to crossing that boundary and joining the statues. Not a fitting end for a warrior—no, not at all. As Hasan pressed forward, Feldard gave himself a mental shake and hurried to catch up, leaving the lead with the elf for the moment but maintained a close second. He gave a passing glance to the two reinforced wooden doors, but had no time to ponder what lay beyond as Hasan pressed on. “Isn’t this all a little hasty?” called Miklos from behind the group. As the elf had brushed smoothly passed him, Nicolai had frowned and watched as he cocked his ear at the door and scrabble for the handle. He’d missed several points of safety and certainly no attempt at stealth. Which was mostly why Nicolai was standing next to Miklos when Hasan tried the door. Ever present, the priest stood next to Feldard. He turned to him and winked. His gazed returned to the door and what lay beyond. They were now in a 30-foot square room. Golden doors stood in the center of the north, south and west walls. 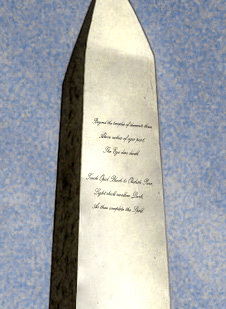 In the center of the room a 15-foot tall white stone obelisk rested on a short golden pedestal. In elegant old Elven script, words were carved in the front. As thou complete the Spell. Miklos watched Feldard’s expression and thought for a while. “The fabulous wealth in platinum statues alone that Elyas owns ….” He raised an eyebrow. “One moment.” He retraced his steps into the previous corridor and studied one of the statues. “I agree with Miklos. None of the Siswa would crave such wealth. Indeed, I doubt such wealth ever existed in my tribe, no rumor—exaggerated as rumor may be—would suggest as much. Come. Follow me! The witch is what we crave, not illusory wealth.” With those words and heartfelt sense of mission to the missing Siswa girls, Hasan turned abruptly away from the riches before the party. He seized the heavy ring of one of the aged doors ahead of the party, braced himself momentarily, and threw his weight against the door, attempting to push it forward into the next chamber. He followed it forward, brandishing his sword. On the other side of the door was a dark corridor, 30 feet long. A pair of bronze doors were at the west end, and single wooden doors were on either side directly across from each other, in the middle of the northern and southern walls, reinforced with iron bands. “Well there is one way to find out.” bustled the cleric as he reached inside his pocket for a copper coin. “Lets see what happens to this.” He tossed the coin through the archway. The copper kopec bounced on the marble floor and came to a rest amongst the other coinage. “Hmmm… maybe the clue lies in those runes.” muttered Miklos as he tried to decipher them. They were written in old Elyan script, and it was proving difficult to translate. Seeing that no one had an answer to his question Feldard forced himself to ignore the call of the treasure and instead moved to the wall with the writings on it. Maybe there was yet another secret passage, hiding the witches. He checked for such. “Allow me,” said Saeth, walking in front of the mage and finally snapping out of her silence (she had been composing a brilliant aria in her head about the rise and fall of the clan of Elyas). With her interest in epic poetry, she was familiar with a wide variety of elven dialects and handwriting. She also wanted to read it before Hasan beat her to it. The elf spun toward the door, armed with his pathetic blades, an enchanted ring and torque, and a firmly set jaw. Maruc slapped Hasan oh the shoulder in a comradely fashion. “Halav has guided us to you, doubt not His wisdom. We are chosen for this purpose, have faith in your friends we will stand at your side.Or possibly right behind you in some cases.” He turned a winked good naturedly at Nicolai and Miklos. Nicolai squinted and rubbed his eyes. The elf’s words chimed not at all with him. He was still trying to work out what the point of all this was. Noble, yes but … he guessed it was the thrill of the unknown that drove him. That and trying to stop these people from committing suicide. Talking of that he checked the door. Satisfied the door was safer than what lay beyond Nicolai stepped aside and allowed the others to continue. The priest backed out of the way and allowed Hasan and Feldard to breach the door. He braced himself behind his shield half expecting some blast of sorcery. Miklos filed his wand away and waited to counter what magic the witch might through at them. On the other side of the double doors was a 20-foot square room bathed in soft golden light. Glowing 15-foot wide silver arches opened through the north and south walls. A pair of steel doors, carved with more elven decorative woodland patterns, stood across from them in the center of the west wall. Beyond the north arch lied what must be thousands and thousands of gold pieces, giant gemstones and ornate jewelry, all overflowing from exquisitely carved chests. A glowing domed sealing sent reflective light bouncing off the polished marble floor and treasure horde. The room through the south arch was identical to the north, but it is empty. As Nicolai surveyed the room for any threats, he noticed some Elven writing above the northern arch.